Our Wet Pour Application gives a seamless effect over the entire area, whatever shape or size the customer requires. Various thicknesses are available with this application , by using a cushion under-surface of 20mm to 100mm thick, depending on the critical fall height, and an impact top surface of 15mm to 20mm thick which requires minimal maintenance that can be applied to both indoor and outdoor surfaces. 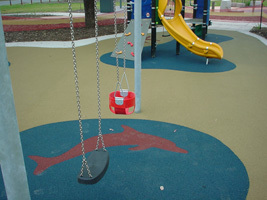 Compliant to AS/NZS 4422:1996 Playground Undersurfacing. Playfall is a business energetically producing a range of attractive, vibrant, durable anit-slip, anti-fatigue softfall matting and surfaces utilising recycled shredded tyres and synthetic rubber. The organisation is fully Australian owned and operated and committed to the effective recycling of the mountain of discarded tyres in this country. FLOOD DAMAGE & INSURANCE QUOTES DONE URGENTLY! SportsPlay Equipment is known for fun equipment of exceptional safety and durability. Since 1996, SportsPlayAustralia has been focused on maintaining the best value on the playground and in the neighborhood. We offer an unparalleled diversity in our product line – ranging from classic and modern play equipment, to a full sports line, and a new offering of thermoplastic site amenities. We're sure to have what you need for your play environment.